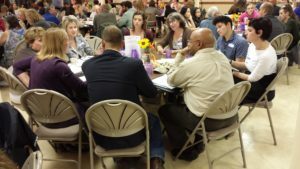 The Eau Claire County Poverty Summit launched on October 6, 2016 with 167 citizens who came together from throughout Eau Claire County. Session #1 included introductions and ground rules; overviews of the Poverty Summit and Clear Vision Eau Claire; local poverty data; and table discussion about the Issues, Challenges, and Possibilities relating to poverty and income insecurity in Eau Claire County. 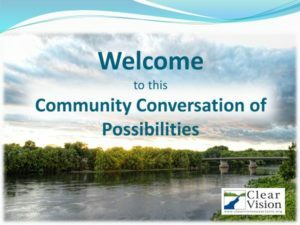 The Eau Claire County Poverty Summit is bringing people from all kinds of backgrounds and experience together. So, Session #1 started with time for introductions around each table, followed by Ground Rules to ensure a safe and welcoming community conversation. Then on to the business of poverty and income insecurity in our local communities. Participants took the 9-question 2015 Eau Claire County Poverty & Food Security Quiz and talked within small groups about the answers and any aspects that might have been surprising. A snapshot of poverty in Eau Claire County showed some of the faces of poverty. It also shared statistics on food insecurity, poverty by age, poverty rates in Eau Claire County, and new ALICE data (Asset Limited, Income Constrained, Employed). Poverty can impact people and families in many ways other than just financial. Some of those impacts on emotional, mental, spiritual, support systems, and more were also highlighted. In total, participants identified 303 Issues on poverty and income insecurity. Some were mentioned at more than one table, for example Transportation was listed 8 times overall. Now, these issues will be grouped into themes to help participants as they continue discussing Issues and Challenges at the next Summit session. Session #1 ended with participants sharing a one-word evaluation of “what went well for you this evening?” with others around their table. 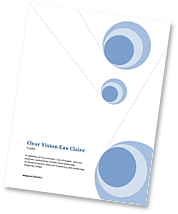 This Public Evaluation is a standard close at every Clear Vision meeting and will be a regular part of each Summit session.